THe 2018 PEI Dairy Youth Trust Fund Scholarship Awards are now available. Please encourage any students pursuing a career in Agriculture to apply. A Showmanship clinic will be held Friday evening at 7pm. Congratulations to the following 2017 All Canadian Nominees who were Bred or developed in Prince Edward Island. Harry VanderLinden and Rob Beckwith will be in attendance. The Classifiers started in PEI on April 17th. 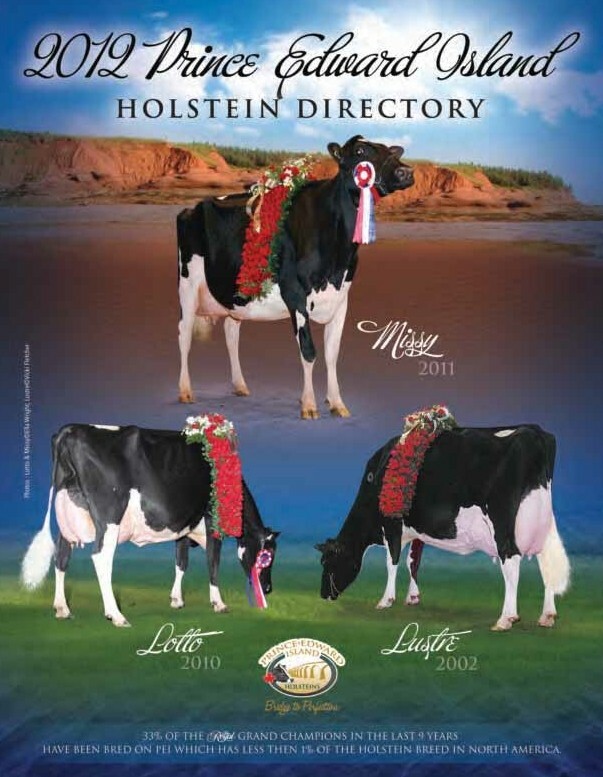 Be sure to check Holstein Canada's classification list and our facebook page for updates. April 29th plan to be in Fredericton, NB to see some great PEI Holsteins at the Atlantic Spring Showcase. 9am start. National Director Harry VanderLinden and Field Service Rep Robert Beckwith will be in attendance. Along with the All Atlantic Night the Branch is organizing an on farm cow show for that day. Cows must be registered by January 24th. Classes will consist of 1st lactation or 2nd lactation cows. Animals can be clipped and washed - but no other prep material used. Representative from the farms must attend the All Atlantid Night. This $1000.00 bursary is available to the son or daughter of a PEI resident currently pursuing their studies at a post secondary level. Preference will be given to undergraduate students with an interest in animal science, animal genetics and/ or business. - No individual will be eligible for a second award. - Unsuccessful applicants may reapply as many times as eligible. Secretary Dairy Youth Trust of PEI Inc.
Congratulations to Lexis Holsteins - Gene and Cheryl Smallman and Family and Winterbay Holsteins - John, Janet, Jeff and Amy Bysterveldt and Family on being named Master Breeders. This is one of the highest honors that a Breeder can achieve. 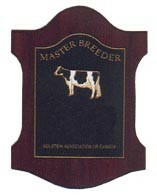 They will receive their Master Breeder Shields at the National Convention in Alberta in April. The Atlantic Dairy Championship Show was held on October 17, 2015 in Truro, NS with 104 head paraded before Judge Joel Phoenix. Th Progressive Visions sale will be held at Crasdale Farms on August 14th, 2015. Over 100 head will sell. Check out the Catalog here. Holstein Canada is now offering two field service positions, one in Atlantic Canada and one in Western Canada. Here are the details of the positions. Please contact Holstein Canada if you are interested. Best of luck to all of the exhibitors at todays show. Keep up to date on all the action - The show is being live streamed at Cowsmo.com. Go to Cowsmo.com for all placings. The Prince Edward Island Holstein Branch would like to offer a special welcome to all the Holstein Breeders that will be visiting the Island as part of the Pre Convention Tour. We are looking forward to an exciting convention week. 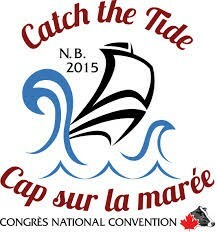 Click on the convention logo to see all the details. The Island Spring Sensation Sale will take place on March 28th, managed by Blair Weeks. Be sure to like Island Spring Sensation Sale on facebook for all the sale updates. 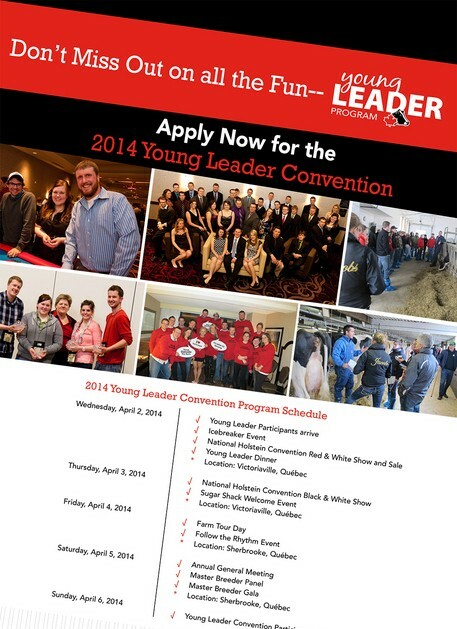 The All Canadian Nominations are now out for the 2014 Show season. Once again Prince Edward Island Breeders had a very successful year resulting in 12 nominations. Idee Holsteins with 3 homebred nominees and Winterbay with 2 homebred nominees were among the leading breeders of nominations. The complete nominations are available at the Holstein Journal Site. The Directors of the PEI Holstein Branch would like to wish all of our fellow Holstein Enthusiasts all the best for an exciting 2015. Check out our Calendar for all the exciting events coming up over the next few months. A beautiful fall day in Truro, NS was the setting for the October 11, 2014 Atlantic Dairy Championship Show. Jack Lomeo of Lowville, NY handled the task of judging the fine group of Holsteins presented. Bernadale Holsteins had an exceptional day, exhibiting or partly exhibiting the Champion, Reserve and Honorable Mention of the Junior Show, the Intermediate Champion and the Grand Champion. Idee Holsteins took the Jr Breeders herd and the Junior Banners. Congratulations to Eastside Holsteins on breeding the Junior Champion at the Junior Holstein Show at World Dairy Expo in Madison Wisconsin. Eastside Brady Carmel was named the Junior Champion. Best of Luck to all Prince Edward Island Bred Holsteins in the World Dairy Expo Show. Take a look at the recent updates on the Blue Diamond Farms website. The Provincial Holstein Show was held at the Exposition Agricole et le Festival Acadien (Egmont Bay Exhibition) on August 30th. Rock Hebert had the task of placing the 61 head. Show Results for the Atlantic Summer Classic in Charlottetown. Judge Donald Dubois. The PEI Premier Heifer Show was held on July 26th with Brian Masters as Judge. There were 63 head shown. Check out the show results page for complete results. 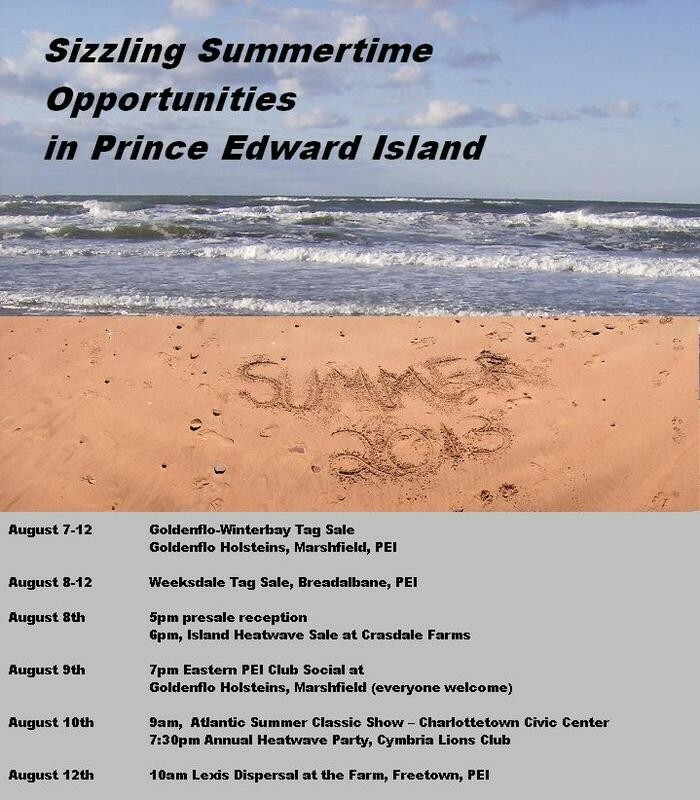 Plan now to attend the great events happening in PEI this summer. July 26th the Crapaud Exhibition will be host to the PEI Premier Heifer Show 11am showmanship and 1pm conformation. August 9th features the Atlantic Summer Classic Show as part of Old Home Week in Charlottetown. August 30th Abrams VIllage and Lfestival Acadien will Host the ADL PEI Holstein Show. See you on the Island this Summer!! 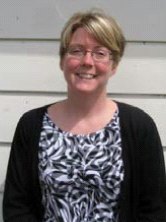 The Central West PEI Holstein Club will hold its Annual Banquet on April 26, 2014 at the New London Community Complex. 7:30 start, 8pm meal. The banquet will include the annual fun auction. The Classifiers have just finished the December Classification Round in Prince Edward Island. Go to our Awards/Classification page for the highlights. Central-West Annual Meeting will be held Jan 7th at lotus Garden Restaurant in Kensington on Jan 7-2014 at 11:00 am. Guest Speaker Shawn McKenna on Hoof Care. Please message or contact Cynthia Frizzell to reserve your free meal. There will also be a special door prize. The 2013 PEI 4-H Dairy Team had a very successful day at the 2013 TD Canadian 4-H Dairy Classic at the Royal Winter Fair. The team came away with the 3rd place overall county/province award. The highlights included Connor Mann winning the Jr Showmanship class for the second year in a row. In Conformation Kyle VanderKloet led the way with the Honorable Mention Champion with Eastside Atwood Glee. PEI Holsteins were well represented at the 2013 Royal Winter Fair. One of the highlights for PEI breeders was the longtime production class of the seven cows in the class 3 were bred in PEI. 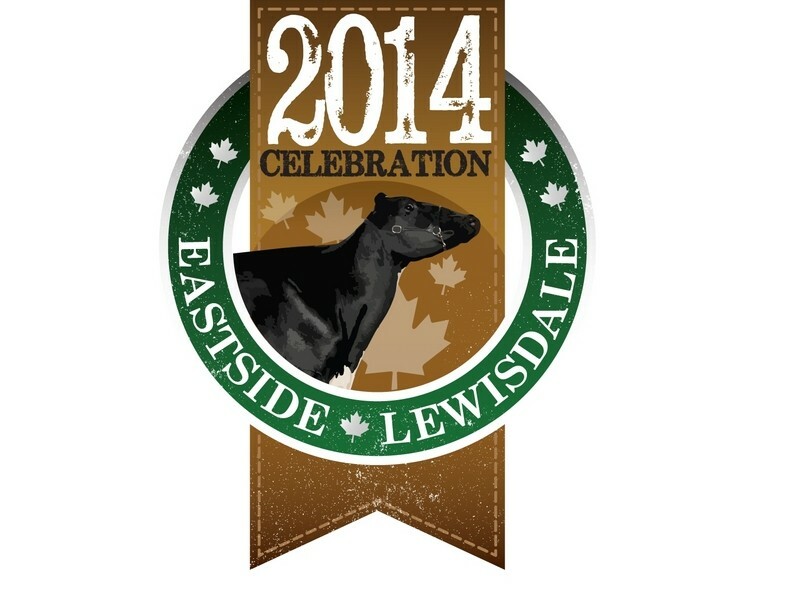 Eastside Holsteins bred cattle captured two class winners, in the Summer yearling and Longtime production classes. 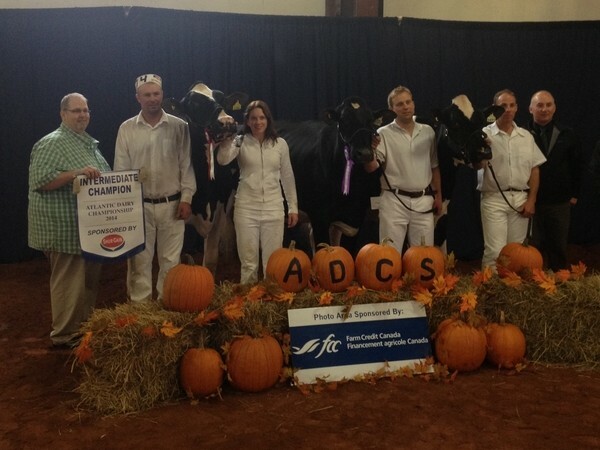 The Atlantic Dairy Championship Show was held on October 12, 2013. 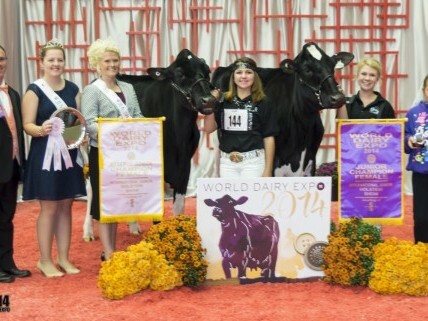 Island bred cattle once again had great results at World Dairy Expo. Extondale Sid IAMS bred by Extondale Farms earned the win in the milking yearling class. Eastside Atwood Glee bred and exhibited by Eastside Holsteins was second and best bred and owned in the Summer Yearling Class. In the Junior Two Year Old Class Weeks Dundee Anika bred by Weeks Holsteins earned the second place ribbon. 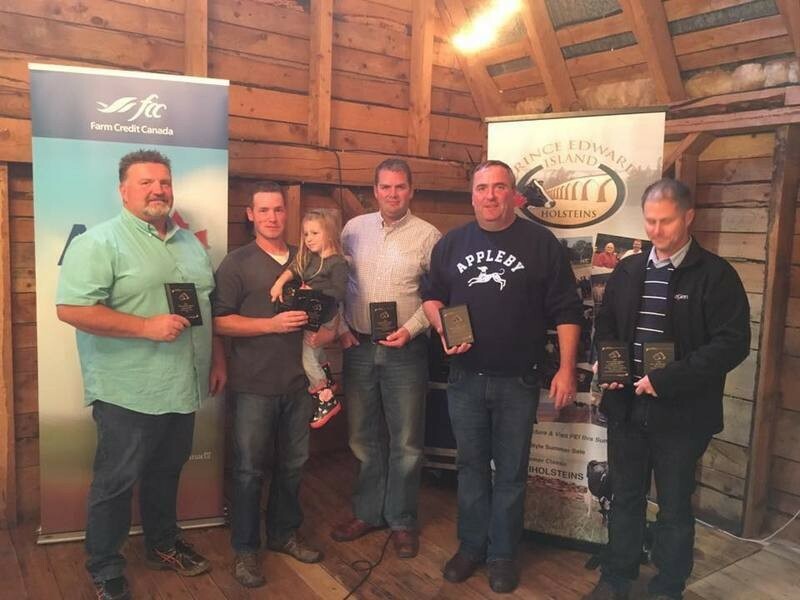 October 11th and 12th the Atlantic Holstein Industry will focus on Truro Nova Scotia for the Atlantic Dairy Championship Show and the Sale of the East. It all starts on Friday with the Atlantic 4-H Show at 1pm. The sale of the East starts at 6:30 on Friday. The Open Show will be judged by Adam Liddle and starts at 9am on Saturday. See you at the show! Results will be provided here as the show takes place. The PEI Provincial Holstein Show was held on August 31, 2013 at the Egmont Bay Exhibition in Abrams Village, PEI. Judge Yan Jacobs placed the 61 head. Grand Champion was Idee Goldwyn Lunette. Reserve Grand Champion was Weeksdale Goldwyn Rainia. The Atlantic Summer Classic Show was held on August 10, 2013 with Bruce Mode performing the judging honors. PEI Premier Heifer Show today at Crapaud Exhibition. Congratulations to Frizzells Valleyville Farms with Champion on the Senior Yearling Valleyville Sanchez Starstruck, Reserve and Champion 4-H went to Adam MacKinnon (Owned by Nordale and Weeks) with Hodglyn Braxton Rhianna. Reserve 4-H Calf went to Adam MacKinnon with Nordale Attic Lidia. Champion Showman Connor Mann, Reserve Champion Showman Kyle VanderKloet. Complete results Check them out here.